To read this plaque, you have to cross this bridge on foot, which I did on Sunday. Having read it, though, you’ll want to call the Jefferson bridge over the Santiam by its proper name henceforth. 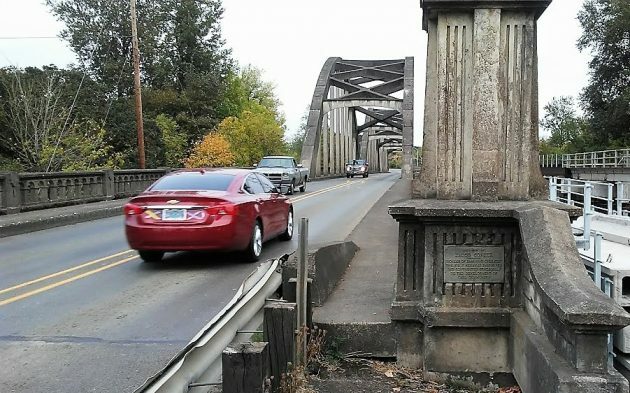 It’s the Jacob Conser Bridge, named for the pioneer who crossed the continent to the Willamette Valley on the Barlow Trail with the intrepid emigrants of 1848. 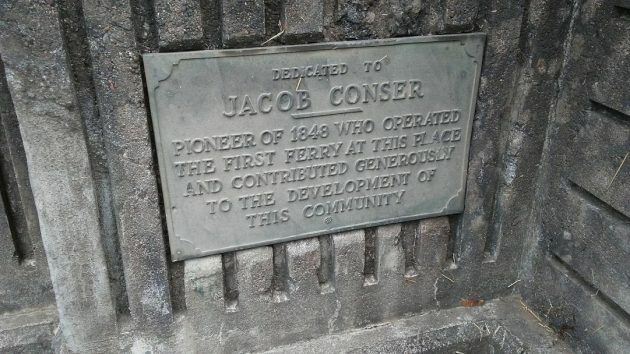 People in Jefferson obviously know about Jacob Conser, who operated a ferry across the Santiam, served in the legislature, founded their town, became its mayor, and accomplished many other things, besides starting the Oregon clan that bears his name. Motorists driving across it daily may not know that the bridge is the third in that place. It was one of the last designed by Conde B. McCullough, the legendary state bridge engineer who perfected the use of concrete reinforced with steel bars in Oregon bridge construction from 1919 into the mid-1930s. The previous steel bridge there, on the Pacific Highway, was deteriorating. It was also damaged by two car accidents blamed on its width, a mere 16 feet. McCullough and others decided that rather than fixing the bridge, they would build new one. In 1932 they designed a concrete through-arch span. The Clackamas Construction Co. of Oregon City got the contract, and in 1933 the new bridge was done, with a road deck measuring 24 feet curb to curb and a maximum clearance of 20 feet six inches. The cost was about $100,000. The money came from Uncle Sam, granted by the Public Works Administration under the National Industrial Recovery Act of 1933. There’s more about the Conser Bridge, including all kinds of technical details, in a 1992 report for the Historic American Engineering Record (HAER OR-42) compiled by the National Park Service. You can find it online here. So, the Answer Man has unearthed an historical nugget! Thank you HH. That nugget that probably few of us knew about, does make one wonder why Mr Conser was inclined to pay for a Bridge that benefited the Hacklemen’s and the Monteiths. You seem to be reading things into the story that weren’t there. Conser ran the first ferry there. Why would be pay for a bridge? Regarding the government work forces (such as CCC) that FDR put in place during the Great Depression of the 1930s, we should have had something like that after the 2008 Great Recession to rebuild our bridges instead of bank bailouts. Oh, well, Trump is in, and the country’s infrastructure is falling down around us while he yaps to his base and completely ignores global warming which will finish us all off! Probably the dumbest … I’ve read today… thanks for the great laugh, snowflake!! I guess I have to reply to that as they are now saying that wind energy will be worse for climate change than gas and oil. Then the dams are also a great energy storage so when you can explain the ice age to us we might jump on ship. The bridge Hering contemplates was built under the auspices of a program created by Franklin Delano Roosevelt – a leader who actually did things to help all Americans during a tough time – the Depression. Now that we are in unprecedented economic times and unemployment is at a near all-time low, the current occupant of the White House seems intent on giving a leg-up to the wealthiest while nominating violent, mysogynists to make certain things remain that way. Lordy, lordy…those rich, women-hating folks sure do need some assistance. That’s what you (and others) took away from this story? If so maybe you need to look in the mirror and ask who really is the problem. Boy, some folks have gone in the weeds. McCullough’s body of work has stood up well. I’m only aware of one that’s no longer in service — acrosss the Alsea at Waldport. The concrete used local sand that had enough salt to corrode the rebar. The decay was identified during inspection, so the bridge was replaced before collapse. The first design for the replacement was a plain-vanilla freeway type. The public howled so mightily that the replacement is esthetically in the McCullough style.